December was incredible for my spoon venture. I sold 4 spoons at the end of the year and felt the pressure of filling "orders". This still blows my mind. I officially opened the shop section of this website only a year ago and it's been so well received. I can hardly establish an inventory but that's a production problem that fills my heart. In addition to selling spoons, I thought I would explore the knife business by selling carving knives to budding carvers. In theory, this is great but the reality of shipping knives in the mail without proper blade protection is a bit of a liability. Safety first! I needed to make protective sheaths... Wha-what? Knife sheaths?! As you might imagine, I was clueless, especially for this curved blade below. Curved blade knife used for carving the bowl part of a wooden spoon. YouTube was full of suggestions for straight blades but the curved blade left me stumped. Insert Jesse, a good friend and owner of the Jewelry Studio of Wellfleet. She suggested I take the leather jewelry class offered through the Art School at the Boca Raton Museum of Art. The logic here was that instructor would likely have enough experience in leather working to point me in the right direction. It would be a fun class and get me out of the house. Sure enough, that's exactly what happened! Honestly, the class didn't exactly fulfill my sheath dreams but it did solidify fun into my schedule. I got so much joy from the creative process. Learning something new scratched my own creative itch. It helped break-up the caregiving monotony and the perpetual thoughts of feeling stuck. This leather class reconnected me with my "old" self, the person I was before this whole mess started and reminded me of these wise words by Nayyirah Waheed in her book Salt. Adjustable, yellow-dyed leather bracelet with eyelet detail. Secured, teal-dyed leather bangle with brass and nickle eyelets and riveted closure. 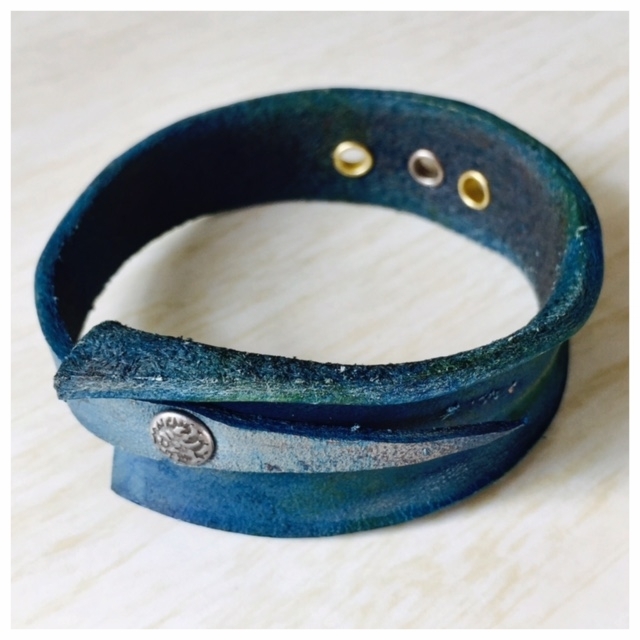 Secured, navy-dyed leather bangle with assorted rivets. Cause, I love rivets! Unfortunately, it's not all fun and games. My dad was in the hospital at the end of the year. We made our way to the ER at 3 AM via ambulance which my hope is for the last time. The event proved tragic for both of us. Awaking to his health concerns in the middle of the night, I was forced to recognize the hopelessness of our situation as I too was sick. Only hours before I was throwing up for some unknown reason. Food poisoning? Flu? No idea... But the reality was stark. We were alone. I was slow to respond and overwhelmed at the crisis. I called 911 somewhat unsure if he was having a 911 moment. This is a frequent mental debate I think many caregivers experience. Is the given episode worth the chaos that follows? Am I ready to light this match? True to form, that phone call was the match that started a fire, and swept us straight into all the misgivings of the healthcare system. If it were my own life, then I might be more obliging to the procedural side of things. The parlay of treatment makes sense in regard to the longevity of health but not when measured alongside that of dementia. My father (and I suspect many seniors that end up in the ER), became a matter of medical whims. A test subject for assumptions... The inability to describe what's wrong often leads to random tests, many of which are safeguards backing medicare compliance and have little to do with physical health and everything to do with who picks up the tab. The liability on part of the healthcare industry is much too great and therefore procedural tests and treatments, (several of which I now know were absolutely unnecessary) have become the backbone in determining a diagnosis for many elderly. This medical process of elimination is nothing short of confusing for anyone with some form of dementia and is often physically painful. The excruciating cries, barely muffled by a curtain, are damages accrued to both the individual and their caretaker. Where one feels the physically pain, the other is destroyed at heart, and the over all sense of hurt and suffering only gets compounded. It's these visceral cries that continue to haunt me from my mom's sudden passing. These sounds I can't unhear... Sounds that have been nothing short of brutalizing and ring all the more loudly when it comes to paying premiums. Ultimately, my dad's hospital trip proved "minor". He was discharged later in the day with a diagnosis of mild constipation and some acid reflux. We were sent home nearly 10 hours later with over the counter prescriptions and I had a new headache in how to unwind the trauma he just incurred. What people don't realize is that managing dementia is the art of managing chaos. Rather than implement chaotic measure at the ER, staff could better their services by foregoing some procedures and listening first to patients between their garbled words and observing their behaviors in their most basic form. Treating through the distortion is not exactly "treating" a dementia patient and the health profession could learn a lot by just looking and listening. Doctors will likely refute this statement but that illustrates the refusal to listen. To truly care for someone with dementia you must first care for their environment. Actions and procedures need to be assessed with regard to overall comfort because it's what happens later, behind the scenes, that ultimately impact one's quality of life. When we returned home, my father's anxiety was at an all-time high. He was restless, experiencing a new pain (urinary, because he was forced to have a catheter rather than water that would help him pee on his own), and agitated in a way that I found abnormal to his norm. He repeatedly said he was in pain and dying, leaving me again feeling helpless and ultimately hopeless. Somehow we got through the night and after a follow-up check-in with his primary, it was determined after he left the hospital (where he had an EKG) and prior to this doctor's visit where he had another EKG, he suffered a heart attack. The worst part is that I think I watched it. I saw it happening and yet remained inactive both out of fear that another hospital trip might in fact kill him while also taking foolish comfort in the idea that he would never have been discharged if his condition was at all serious. His condition at the time was not serious but his endured stress from the experience went overlooked. Long story short, I enrolled him into hospice care shortly there after. For those of you that feel sorrow towards what you think hospice means, I encourage you to do some research. (You can start right here.) This is actually one of the best decisions I have made and stand by their approach of patient and family centered comfort-care. I'm happy to share more about this decision in the comments or through private messaging if you want but for now just know that this is a good thing. I'm hoping the hospice team will enable my dad to live his best version of life for the time that remains. I want to do small things with him when I can and I don't want to live in fear that taking him somewhere might risk his health. He's almost 86 years old. The risks are plenty obvious! But I need to part ways with the burden of caregiver guilt and feel confident there is a team of health professionals that get us. We want to live life, not wait for its passing. Thus begins our new forward perspective... and below is a little taste of what that looks like. At the Boca Raton air field for the WWII airplane tour. Ok, back to knife sheaths! At the start of the new year, like a gift from the universe a leather knife sheath class was being offered locally. (Wwwhhhaaaaattt?!!!!!!!!!!!) Clearly heeding the sign, I enrolled. It was a five hour workshop and as expected, it was for straight blades. But, beggars can't be choosers! I took my straight craving knife to the class thinking I needed a sheath that runs parallel to my belt. Not the perpendicular style where the knife points down. I wanted it across my lower back all discrete like a bad a**. Granted, this is a work in progress but you kinda get the idea. Just imagine this sheath like a rugged tramp stamp. You with me?! Straight knife sheath for my Mora carving knife. Well, you know how one thing leads to another. It just so turns out that the place that was offering the sheath classe is interested in hosting a spoon carving class! 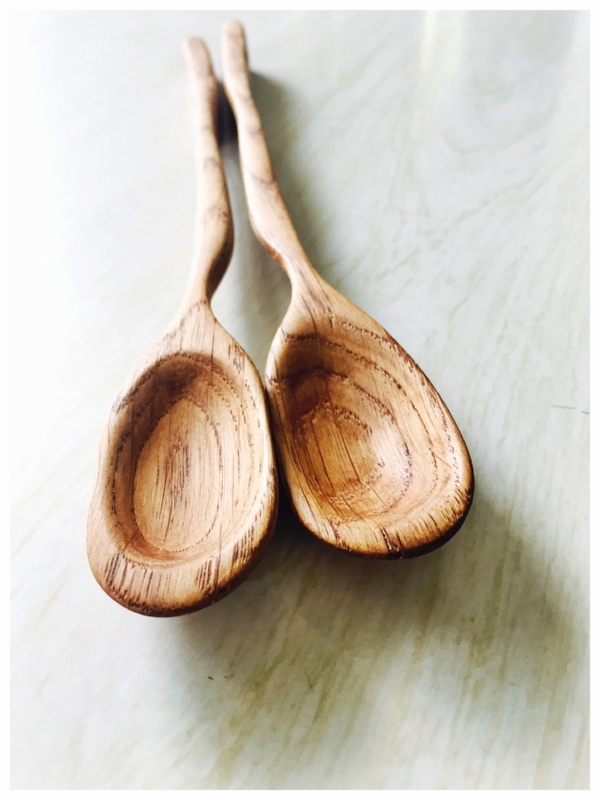 Like a true act of fate, I met the fine folks over at The Guild Folk Art School and in a few short weeks we will be hosting a spoon carving class for the community. I'll keep you posted on dates when we work that all out but in the mean time, take a look at their offerings. 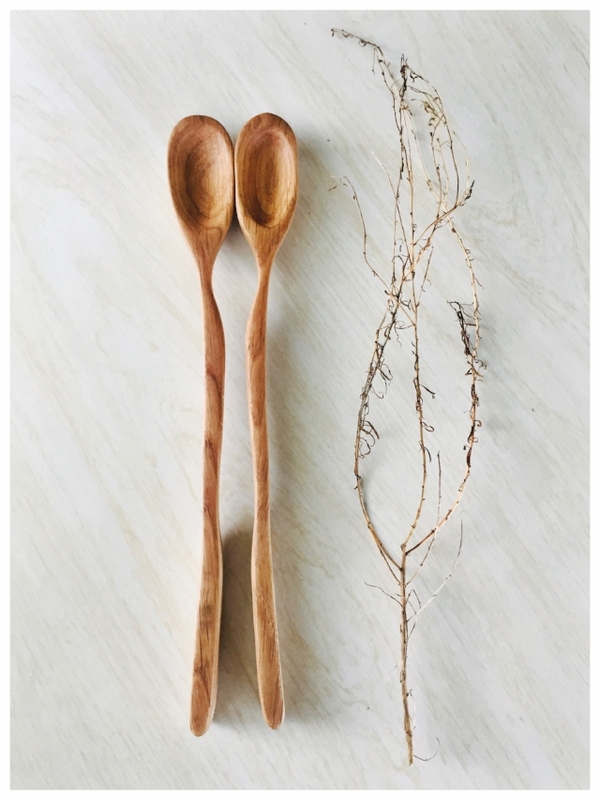 Everything from blacksmithing to ceramics to knife making (you know that's next;)) and more! Take a look. Another new year high has been completing this 30 Day HIIT Challenge during the month of January. There are lots of excuses I could have made to fall short on this goal but when my friend Erika sent it to me post binge eating holidays (which I continue to stand by! ), I realized, I had no excuse. I could make excuses but none of them truly held weight and rather then complain or pass judgement on why this challenge wouldn't work, I just committed. I suspended judgement and expectations and pursued the challenge of discipline. I find it easy to fall prey to the inertia of caregiving and neglect things. What's worse is society almost makes the excuses for me... "Oh, go easy on yourself. You have a lot on your plate". That might sound reasonable but deep down I know when I'm being lazy. So yeah... An experiment in exercise but more, an experiment in follow-through. About two weeks in I realized the hard part about exercise for me is just knowing what I was going to do on a given day. Good intentions are nothing without action. This challenge told me exactly what to do and no equipment was necessary. Bingo! I have no mental space to create an exercise strategy here. Just tell me what to do and I'll do it! So, I also pulled the trigger on this workout book! 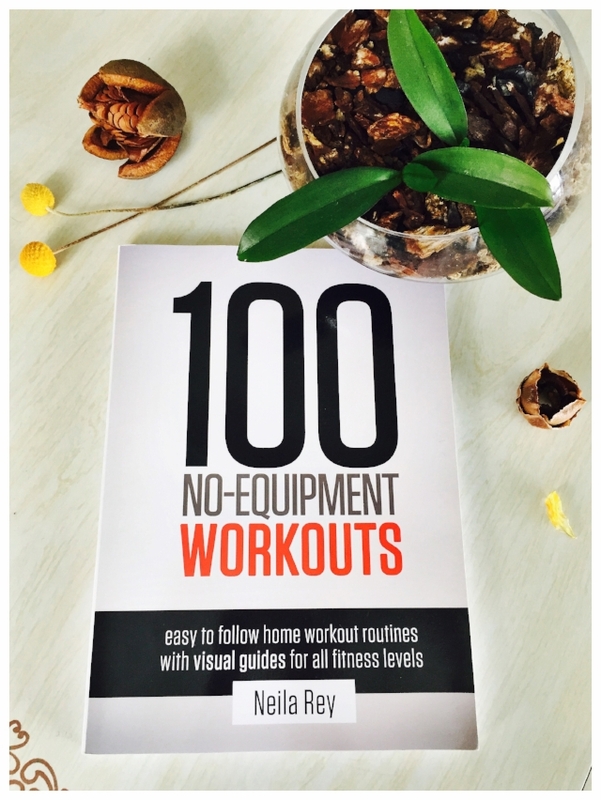 I figure, 100 workouts to complete over the rest of 2018 shouldn't be so hard. That's about 9 workouts a month (cause it's February now) which seems more than manageable. And the no equipment necessary/can-do anywhere factor helps eliminate the obvious excuses. If you are curious what's inside I put an Amazon link below. It's the same deal at the challenge link above but expanded. Also, if you have any suggestions for timer apps please send them my way!!! As for anyone following my pistol squat attempts, just know that they are coming... one day. Not sure why I thought I'd have those down in a month but reality checks are a good thing! * This page contains an Amazon affiliate link. If you click on the affiliate link and make a purchase, I will earn a commission at no extra cost to you. This helps maintain the cost of How To Feed A Senior. Thank you for your support.